Well it really isn't the first snow bunny but yesterday was the first real snowfall of the year... big fluffy flakes. Did I mention that we have a plethora of bunnies around the old homestead? We started with one Handsome Stranger of a bunny who wandered in one day about 2 years ago. "Hey Honey look, a bunny". 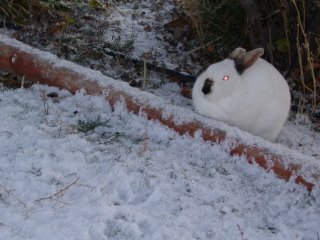 He was kind of tan or buff colored, we called him the Mega Bunny because he was Huge. He hopped around and ate the grass for a couple of months but we could see that he was lonely. One day a beautiful white rabbit showed up and they figured out who was the boy and did what rabbits are known for. The first time we saw the little babies, my wife just squealed... (actually she still does). We have about 30 rabbits around here now. They probably are doing damage with their digging but I can't get too upset about it. The fricken gophers are another matter. The rabbits are pretty tame. Sometimes you can get almost close enough to touch them before they casually hop away.